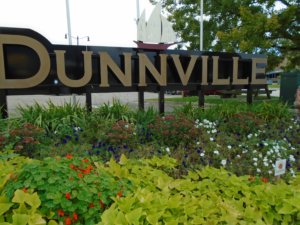 The Dunnville Horticultural Society was organized in 1929 through the efforts of several interested citizens. The Women’s Institute canvassed the town for members and Mr. William H. Wingfield was elected the first president and Mr. Charles Bilgar was the first secretary of the Society. The first public planting was carried out at the paths that diagonally cross Central Park. A couple years later, in 1938, the Society became involved in beautifying rural schools when numerous shrubs were supplied to landscape the school properties. In this same year Mr. W.H. Wingfield was presented with the Horticultural Service diploma. A new flower bed was located in front of the recently constructed band shell in 1939 and a tree was planted in Lion’s Club Athletic Park in commemoration of the King’s visit. The first public planting of trees on town streets started in 1940. “Increased Interest and Effort,” was the motto for 1942. In 1945, the planting of the T H & B property on Queen street was started under the direction of Mr. Tambling. the local school children received over 1000 packets of flower and vegetable seeds in 1947. Arrangements were also made with the Lion’s Club to hold a flower show in conjunction with their Horse Show in Lion’s Club Park. In 1948, the two flower beds adjacent to Cedar Street were planted with tulips and crocus which were the first bulbs planted since the start of World War II. The largest Flower Show staged by the Society took place in 1950 with 505 flower and 96 vegetable entries. The Society made its first attempt at holding regular monthly meetings in 1953 under the direction of Art Thompson and Roy Miller. A Coronation Tree was planted at the Town Hall in honour of Her Majesty Queen Elizabeth II. The flower beds were planted with purple, gold and red for the Coronation Year in 1953. The first Rose Show was held June 24, 1956. In the following year, the Floral Clock was the new project. A Junior Horticultural Society was formed in 1968 under the leadership of Mrs. James Murphy. The Junior Society members entered exhibits in the Rose and Fall shows. The Trillium Award for home beautification was introduced in 1975. Twenty one nominations were received and eleven Trilliums were presented to the winners. The Society entered the Mudcat Parade for the first time in 1978 when Mr. William Lyons allowed the Society to use his horse and wagon for the parade. There have been many dedicated persons who have worked diligently to make the Society successful since its formation in 1929. A house, barn or organization must be built on a strong foundation to stand. The members over the past 74 years have not only built a strong foundation but have reinforced it substantially since the early beginning. 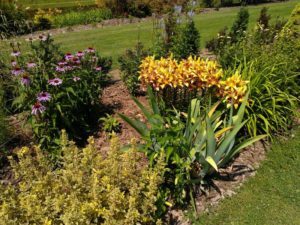 We believe that the present and future members of the Dunnville Horticultural Society will work as hard and diligently as the early members so that they strong organization will be in force during the Society’s Centennial Year in 2029. The first horticultural society in Ontario was organized in 1834. Currently there are more than 280 societies with over 40,000 members. For many years societies were part of the Ontario Agricultural Association but in 1906 a separate Horticultural Association was formed. The Association and its member societies played a prominent role in having the white Trillium Grandiflorum adopted as the floral emblem of the province of Ontario. The Ontario Horticultural Association along with its member societies has an outstanding record of accomplishments. Community work has included school ground improvements, conservation projects and arboretums and community plantings.